This captivating cascade of beads is crafted from tightly rolled strips of recycled paper. Handmade by artisans in Uganda, this attractive necklace transforms waste material while empowering makers to rise above poverty through employment and education. The captivating cascade of beads is crafted from tightly rolled strips of recycled paper coated in varnish for strength and durability. 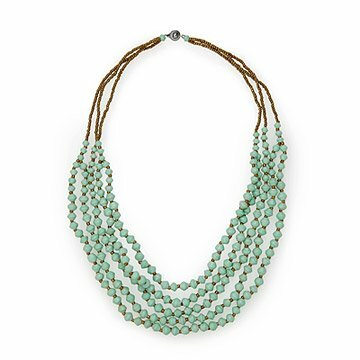 This lovely, layered array of mint green strands makes an elegant statement necklace paired with jeans or a favorite dress. Handmade in Uganda. Wipe with a damp cloth. Do not submerge in water. I bought this for my mom but it arrived after Christmas. After looking at it in the box for several weeks I finally decided it was mine and I'd have to find another gift for my mom! Many statement necklaces are heavy but this one is so lightweight. It's very comfortable without appearing cheap/tacky. I wear it day after day and feel like it gives my outfits a little extra polish. This necklace can go with jeans or a fancy evening dress and anywhere between. It is a very pretty addition to your day.